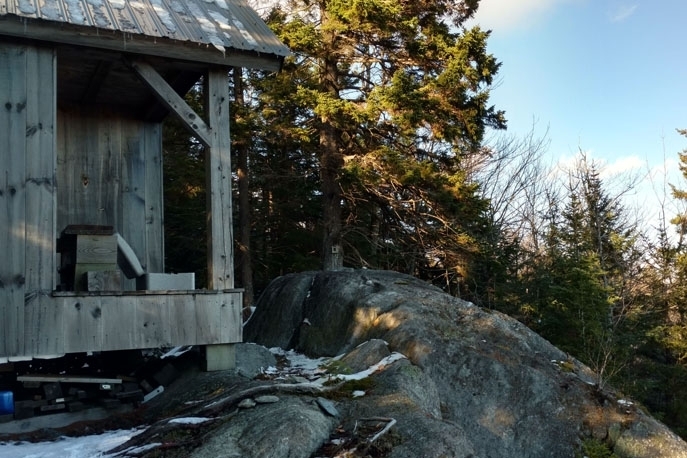 The Cabin Faces East, So Sunrises And New Hampshire Peaks Can Be Enjoyed. The Scenic Meadow On A Small Pond Would Make A Peaceful Site For A Home. The Vast Majority Of The Property Hasn't Been Harvested In Over 30 Years. Well-Constructed Trails Weave Through The Forest And Up To The Cabin. 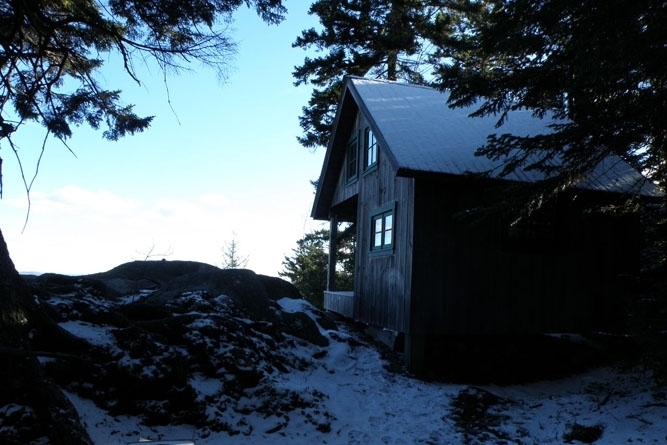 The Cabin Is Perched On A Rocky Ledge At The Edge Of The Forest For Maximum Views. The Cathedral Ceiling Allows For Three Bunks To Be Stacked. A Beaver Meadow Is Visible From The Cabin And Is On The Property. The property is in a rural setting nine miles east of Moretown village and a short drive to job centers, skiing and shopping. The property is just to the east of Moretown Gap in the Northfield Range. 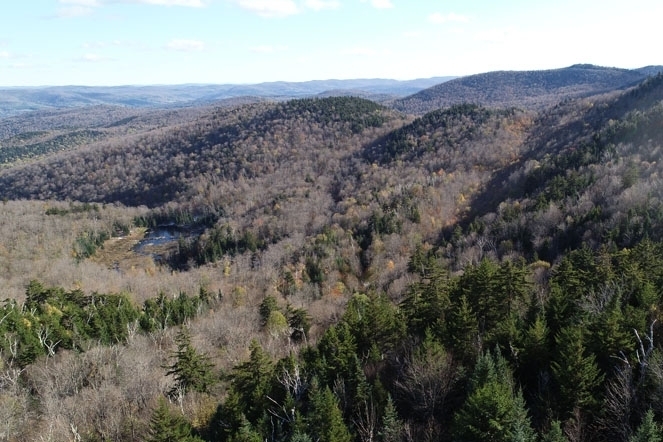 Route 12 is 5 miles to the east of the property, providing access to Northfield, home of Norwich University, and to Montpelier, the capital city, and I-89. 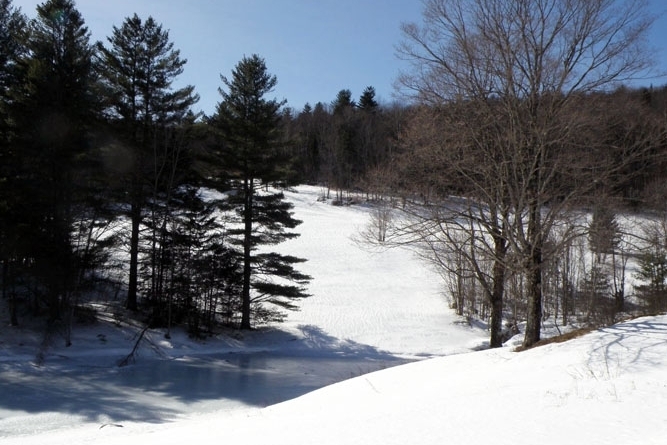 Nearby ski resorts include Mad River Glen and Sugarbush, both 30 minutes from the property. Stowe Mountain Ski Resort is 50 minutes to the north. Burlington, Vermont’s largest city, is a 45-minute drive to the northwest. Boston is about a 3-hour drive to the southeast. The land that is for sale rests on both sides of Devil’s Washbowl Road, an unmaintained town road. Devil’s Washbowl turns off Moretown Mountain Road (aka Cobb Brook Road) as a maintained town road for 1,500 ft to about where the potential home site begins. From here, the road is no longer maintained by the town, but it is navigable by high-clearance vehicles. Because the property is on two sides of the road, there are about 2,800 ft of road frontage, providing multiple locations for driveways and additional trail heads. 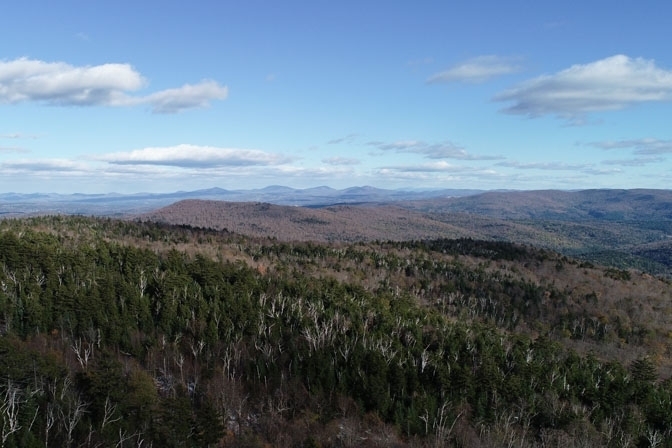 The majority of this real estate, 581 acres to the west of Devil’s Washbowl Road, is forested with a primarily southeastern aspect at the lower elevations and varied aspects higher up where the property drapes over the eastern shoulder of Bald Mountain. Topography is sloping across the entire property, ranging from moderate to steep. Several intermittent streams flow through the property and a beaver meadow can be seen from the cabin. Most trails on the property were solidly built and include bridges for stream crossings. The trail to the cabin is in excellent shape. Less used trails may need some brush clearing. The 10 acres across the road provide an ideal location to build a home, although other home sites may be discovered elsewhere on the property. The area is mostly meadow with a small amount of forest. The terrain slopes gently to the east, with frontage on a small pond at the lowest point. 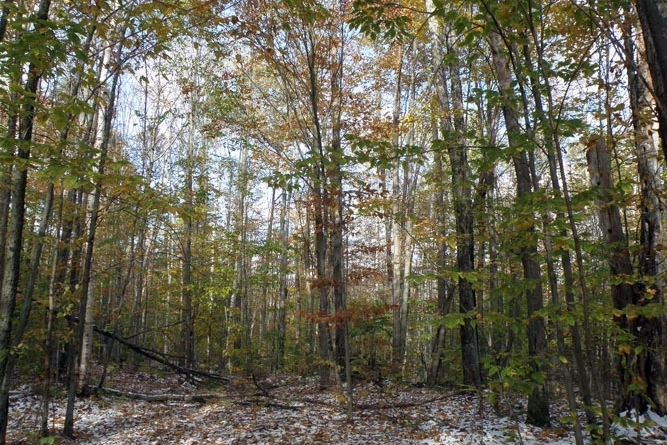 Throughout this forest, there is a diverse and high-quality timber resource. 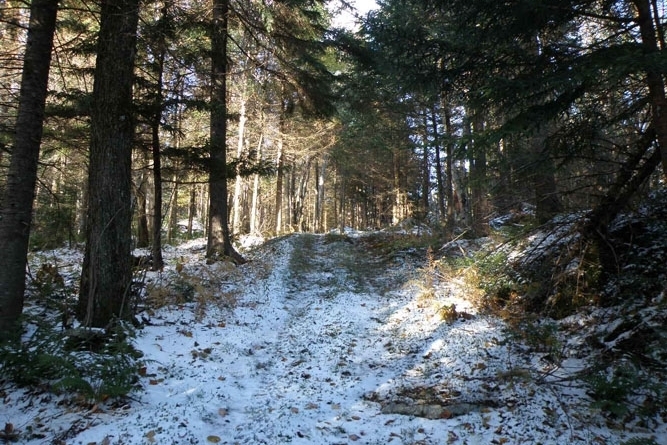 On the lower-to-mid slopes, no forestry activity has occurred in 30 or more years. Higher up in elevation, some cutting was done just after the Great Ice Storm of 1998. Property-wide, the Capital Timber Value (CTV) is $391,300 ($674/total acre). 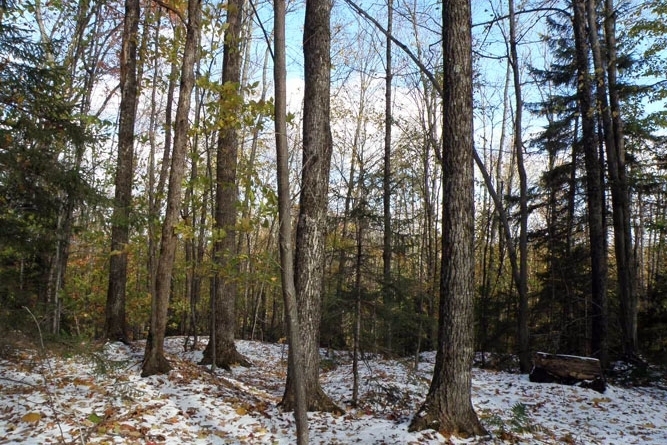 Sugar maple, red spruce and yellow birch sawlogs account for much of the standing timber value. While the forest resource can be a considerable income source as the timber matures, it currently offers a high aesthetic appeal, rounding out the land’s recreational value. 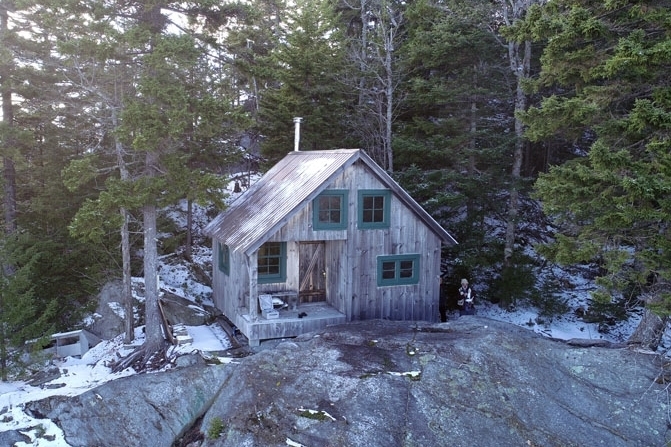 Three miles into the property at 2,280 ft is a solid, comfortable, 240 sq ft cabin, built as close as possible to the edge of the rocky ledge for maximum views. 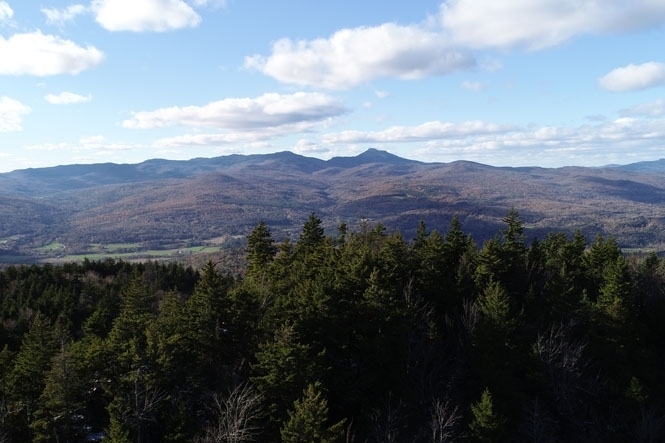 Facing east, the location looks across the rolling hills of Vermont to the Presidential Range in New Hampshire’s White Mountains. On a clear day, Mount Washington is visible. 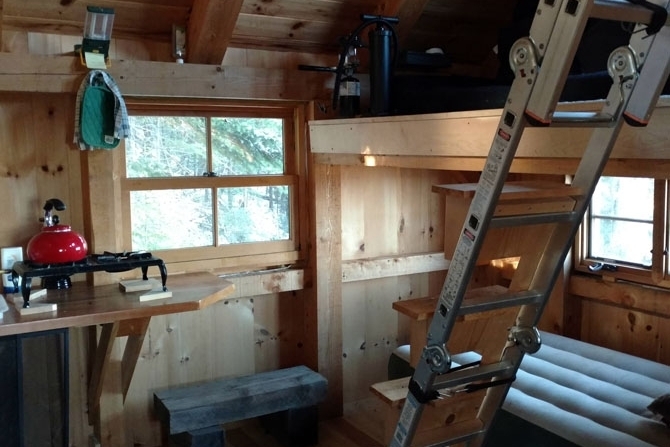 Inside, the cabin features a vaulted ceiling, many windows and 3 bunks, 2 of which are accessed by a ladder. A built-in table by the windows compliments a rudimentary cooking area with a two-burner propane stove and a dry sink. Heat is provided by a wood stove. The cabin is truly a unique feature where you can enjoy the property with no one around for miles. 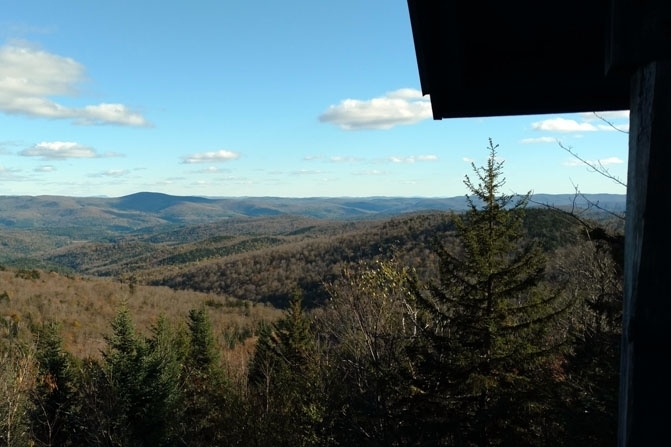 Whether it is mid-winter, hunting season or the height of summer, here is where you can watch the sunrise from the porch, sunbathe on the rocks or relax by the woodstove while the snow gently falls.